What is Cheap Food Here? So, we finally made it to the beach this weekend and chose the tourist hotspot, Jaco Beach or Playa Jaco. We would have preferred something less busy, but it’s the closest to San José and without a car, we are trying to limit our time on the bus. It takes about 3 hours by bus to get to Jaco from the center of San José at the Coca-Cola Bus Terminal. Sidenote- you don’t want to spend a lot of time in the Coca-Cola district. 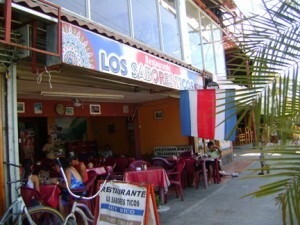 The first place we went to eat in Jaco was by our hotel, just on the edge of the main Jaco shopping strip. It is called Los Sabores Ticos (The Tico Flavors) and I am going to rave about their food. Typically sodas are sodas (traditional tico restaurants) in Costa Rica, until you find the hidden gems. And we hit the jackpot on Sunday morning when we stumbled on the first eating establishment we came across. Los Sabores had large delicious papusas with meat, black beans and cheese for 500 colones, which is a little less than $1. The beef inside was slow cooked and perfect. I also had a fruit plate with granola (about a $1.50), and you can’t really beat the fresh fruit of Costa Rica. There are a lot of expensive places to eat in Jaco, so make sure you are looking for the most non-descript place with dishes for 1,500 colones, plus or minus. And remember them always. If you've got one eye on your plate an the other on your wallet, enter your email address to subscribe to this blog and receive notifications of new posts by email. Cheap food may have earned the misnomer of unhealthy, processed, lacking in nutritional value and causing a variety of health problems. However, Cheap Food Here is dedicated to helping you learn how eating healthy whole foods is the ticket to a long life and saving money in the long run and still being conscious of your budget. Local produce and non-manufactured foods are the best way to live and grow no matter where in the world you are living. Having lived in the US and Latin America, Costa Rica specifically, we have learned that the poorest people are also eating healthier than the wealthy people elsewhere. 3rd World Countries are surviving on cheap food in the form of seasonal, healthy, whole foods like fresh and dried fruit, beans, rice, plantains, zucchini, onions, etc and that it's actually cheaper than prepackaged, garbage foods that you find all over the store shelves. We have created cheap recipes that use real food without MSG and all the other harmful artificial colors, flavors and preservatives. In our book cheap does NOT equal unhealthy. Planning is the key for cutting down your food budget and you will need to change your lifestyle away from the vices of quick convenience foods that are processed so much that no nutritional value remains. Educating yourself on what your body needs to thrive is a great 1st step and eating organic whole foods is the simple answer. We'll lead you on our journey to finding cheap recipes, ingredient substitutes and planning your snacks and meals ahead of time so you can still enjoy the convenience you're used to. Budgeting for food is one of the hardest parts of reigning in your spending and recipes for cheap food just takes a little planning. It's all about prioritization and understanding the difference between needs and wants. The 'wants' most of the time include snacks and unhealthy sodas or foods that fill our stomachs but don't satisfy our vitamin and mineral needs. Stay away from cheap sugary drinks, fatty desserts, chips, etc. These are the foods we need to cut out of our diet and replace with healthy whole foods that are well-prepared and don't include lots of dairy, hormones, pesticides, artificial colors, flavors, or additional chemicals (look for things on the labels that you don't understand and can't pronounce...they are the bad things more often than not). Cheap snack recipes don't have to be prepackaged, sodium-filled foods. With a little forward thinking, planning and execution, your snacks can carry you through the day without making you hungrier later or tired. Home made crackers with homemade hummus or a simple star fruit can be prepared in advance and be a cheap snack for work or between classes. Cheap Food Here also helps to reduce food costs by finding cheap vegetarian recipes that cut down on the amount of meat and replace it with other protein-rich foods like beans to help with a large part of meal expenses. Our cheap recipes never include canned foods (aside from the occasional sauce or coconut milk), frozen pre-packaged meals or the powdered junk you just add water to. We have been blessed with thousands even millions of types of food, herbs and seasonings so why would we need to manufacture cheap foods artificially? To put big bucks into someone's pocket, that's why. But these added chemicals and fillers are tricking us into loving cheap food that's no good for us by overstimulating our taste buds and making regular foods taste bland in comparison. Bring your taste buds back to life with delicious, organic whole foods and enjoy what the earth provides for us naturally. When you're perusing the cheap recipes around the site, make sure you comment to let us know how we're doing and if we need to make improvements. We have tons of recipes for dinner like coconut aphrodisiac soup, homemade empanadas and eggplant parmesan just to name a few. There's something for everyone and will fit just right into your tightening budget. What are you craving? Is it chicken empanadas, or a breakfast burrito? Just type in your favorite cheap food and you'll find all the places you can buy it, cheap recipes to make it yourself and general cheap food ideas related to the search. A popular search is from those who are you having trouble with your chips getting constantly stale. Learn how to unstale your chips so you don't have to throw another bag away. We've organized our cheap recipes as the main item on the homepage in a cheap recipe rotator of our most recent additions. If the descriptions don't jump out and grab you, we're sure the photography will. Also, if you cruise down the page you'll see how to find cheap restaurants, our most popular cheap food posts and some articles highlighting our favorite cheap food gadgets and general food articles. If you still haven't found what you're looking for, perhaps you can try finding it at one of our foodie friend sites along the right hand side. There are cheap restaurants in every town, neighborhood and city we've ever lived in. We can share a few cheap restaurants from Charlotte, NC, Costa Rica and now Tampa/St. Petersburg, FL. Take a look at all the cheap restaurants we've been to and reviewed by clicking on the 'restaurants' tab. Or, if you're interested in food in Costa Rica or the specifics to cooking Costa Rican Food, click on the 'food Costa Rica' tab in the main navigation. We've traveled all over Costa Rica and tried to document as much of the food and restaurants as possible along the way. Now we're in St. Petersburg, FL and will be adding more and more restaurants in this area in the coming months. This will be a work in progress, but the good thing is that a lot of the places we've been to don't actually have websites or they have terrible ones, so they are hidden gems that we're revealing to you exclusively. The trick to finding cheap restaurants is finding your most frugal friends and asking for recommendations or buying coupons on sites like Groupon, Living Social or your local restaurant sites like Restaurants.com to save a lot of good money on the restaurants you already frequent. Cheap Food Here looks forward to opening your eyes to a new world of food with one eye on your plate and the other on your wallet.